Jack Spring is still in the game. Thanks to collector Steve Smith of Fall River, Nova Scotia. He posted on the ever-handy www.sportscollectors.net that he had received two autographed cards from Jack Spring. Additionally, Mr. Spring provided a note saying why he couldn’t answer questions by mail. It’s hard not to be a cynical collector these days. Upon seeing the posting by Steve, I thought of many reasons why Jack Spring was impatient with collectors. Through sportscollectors.net, subscribers can send personal messages to collectors who’ve posted a success or failure. That meant I could find out the truth. Steve forwarded the explanation that Mr. Spring is coping with Parkinson’s Disease, making writing answers difficult. Nevertheless, the former pitcher isn’t letting autograph requests go unanswered completely. Even a signature may be getting difficult. That’s not stopping the stopper. The moral? Appreciate every autograph. Treasure every extra. Some signers are taking extra efforts to give back to the game and its fans. Finger-pointers seek scapegoats. The teams staged a three-for-three swap. Bobby Shantz and Doug Clemens accompanied Broglio to Wrigley Field on June 15, 1964. 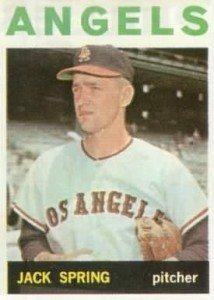 Broglio notched consecutive 17-win seasons in 1957-58, first in Double-A then graduating to AAA the next year. He unveiled his full potential in Class C ball in 1955, winning 20 games. Before he left St. Louis, Broglio enjoyed a ringside seat for the evolution of Cardinals hurler Bob Gibson. When did Broglio know Gibby might be Cooperstown bound? 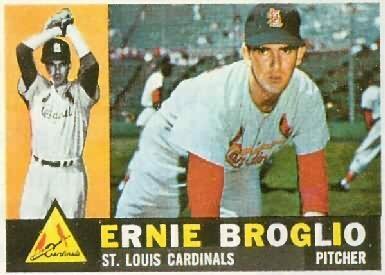 Broglio earned the attention of Sports Illustrated twice, first with a 1961 cover and later with this bittersweet 2000 article in which he reveals the inscription of his autographed photo from Lou Brock.